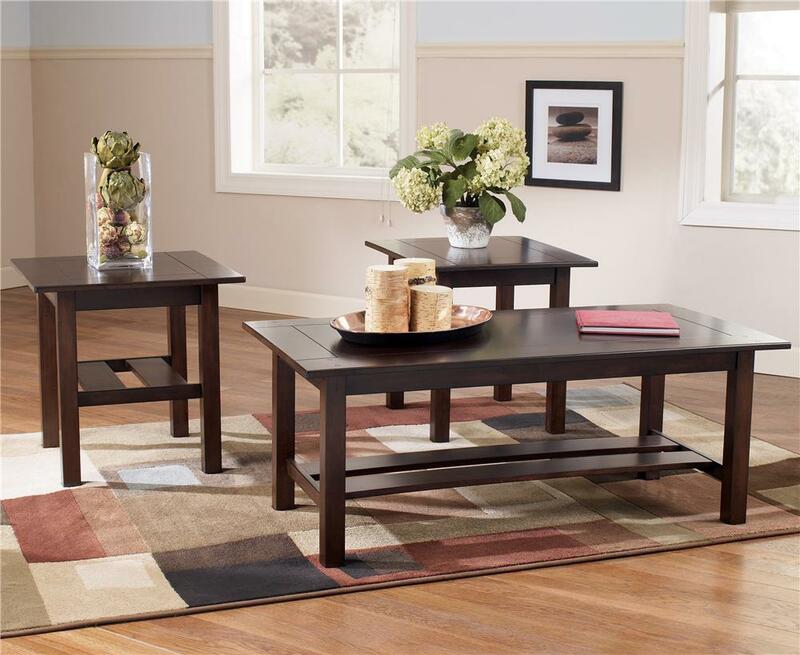 With a dark finish, clean lines, and plank shelves, this three-piece set of occasional tables adds appealing, contemporary style to your home. The modern look of the square end tables and rectangular coffee table feature Arts & Crafts style plank shelves for displaying decorative accents. The generously sized tops offer plenty of room for displaying decorative accessories or serving food and snacks to guest when you entertain. Coffee Table: 46"W x 23"D x 18"H.
Each End Table: 21"W x 23"D x 21"H.
The Lewis Contemporary 3-in-1 Pack Occasional Tables with Cocktail Table and 2 End Tables by Signature Design by Ashley at Suburban Furniture in the Succasunna, Randolph, Morristown, Northern New Jersey area. Product availability may vary. Contact us for the most current availability on this product. Case Construction Medium brown finish. Made with select veneers and hardwood solids. Plank design lower shelf. The clean straight lines and contemporary design of the Lewis occasional table collection features a rich finish and stylish detailing that is sure to enhance the look of any living room decor. The medium brown finish on the straight legs and etched table top details of the cocktail table and two side end tables bring out the unique beauty of this modern collection. With ample table top space and plank style lower shelves for storage, these tables are an exceptional addition to any home. 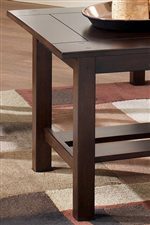 Enhance your home's style with the rich contemporary flavor of the Lewis accent table collection. The Lewis collection is a great option if you are looking for furniture in the Succasunna, Randolph, Morristown, Northern New Jersey area. Etched tops and plank shelves add visual interest.